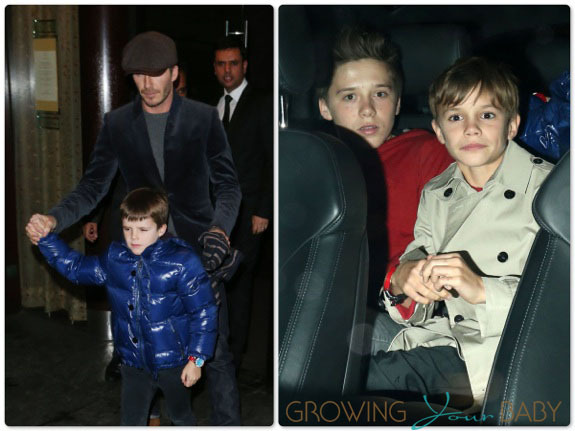 David Beckham Dines Out With His Boys! Home » David Beckham Dines Out With His Boys! David was dapper in a velvet jacket and a pageboy hat as he exited the restaurant with Cruz. Brooklyn followed with Romeo, who wore the same trench coat that he wears in his new Burberry ads. After David’s contract ended with the LA Galaxy, the Beckhams moved back to London where the soccer star has been training with Premier League side Arsenal. Last week it was announced that he had been signed to play for Paris St Germain for one season. With Victoria in New York City for New York Fashion Week with Harper, David has been juggling fatherhood and his training schedule. During a chat on Facebook this week Victoria revealed the boys are doing well with the move. I miss LA! I love America and am very excited to be in New York for Fashion Week, but I’m enjoying spending time in London. The boys are loving their new schools and we’re all very excited about also spending some time in Paris over the next few months!